Online Embroidery Class Sale – Get ’em While You Can! This morning, just a quick little shout out about some Really Good online hand embroidery classes that are on sale on Craftsy right now, and in fact, the sale ends at midnight tonight. Whoops. I should have told you sooner – I apologize! But if you have been hankering to further your embroidery skills, this is a great (and super affordable) way to do that! Below, I’ve included a list of the hand embroidery classes on sale today and also some general notes about Craftsy classes, with links to some of the class reviews I’ve written, in case you’re curious. Yes, I do enroll in Craftsy classes, and I’ve learned some really good things from them! Why take an online Craftsy class? They’re affordable. They’re a great way to brush up on, or expand, your skills. They’re easily accessible anywhere, as long as you have a decent internet connection. They don’t expire, so you can work at your own pace. They include quality video instruction. They include instructor interaction and feedback. And they are taught by quality instructors who really know what they’re doing. Sure, there are tons of classes available on Craftsy, and maybe you’re a craftahoholic who dabbles in all kinds of crafts – well, you’ll definitely find more than hand embroidery classes on sale today! But since I’m an embroidery fiend, that’s what I’m going to tell you about. 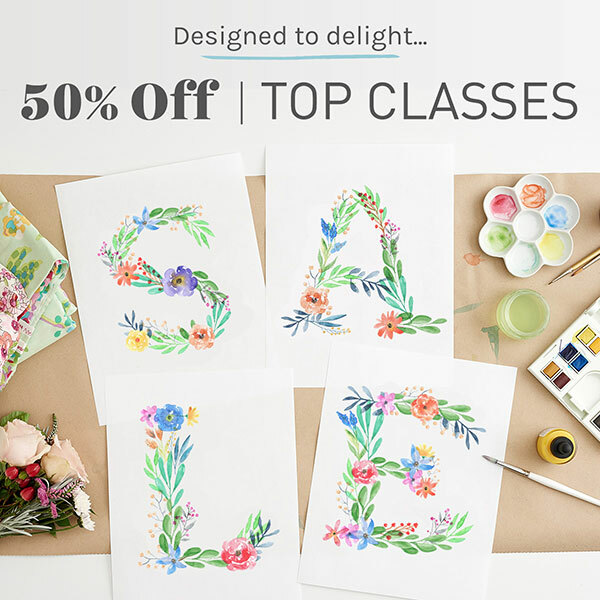 These particular classes are on sale through midnight tonight at 50% off. In the interest of full disclosure, these are affiliate links, which means Needle ‘n Thread gets a wee kickback if you sign up through my links. But it’s really not the reason I’m telling you about the sale! They’re great classes at a great value. 1. Design It, Stitch It: Hand Embroidery – this class is suited to beginners or to those who want to brush up on skills learned long ago. It covers hand embroidery basics and lots of stitches. 2. Embroidering Texture & Dimension by Hand – this is geared towards stitchers who want to explore appliqué and textured stitches and the like. There’s a lot of wool felt layering going on in this class, and it’s lots of fun! 3. Goldwork Embroidery: Essential Techniques – for beginners in goldwork and beyond-beginners, this class, taught by Lucy Barter, RSN graduate, is a dream come true! You’ll learn all kinds of goldwork techniques, you’ll see the threads up close and learn what they’re used for – it’s just a great class. You can read my review of it here. 4. Stumpwork: Raised Embroidery Essentials – for beginners in stumpwork and beyond-beginners, this class, taught by Celeste Chalasani, is another dream come true! You’ll learn basic stumpwork techniques, and then some. You’ll find out how to make your embroidery really explode in three-dimensional splendor. If you’ve been thinking about trying stumpwork, you’ll definitely want to take this class. You can read my review of it here. 5. Bead Embroidery – A nice, accessible introduction on how to incorporate beads into your embroidery projects, this class covers all kinds of stitches using beads. It’s fun! 6. Bead Embroidery: Beyond the Basics – This class takes you deeper into bead embroidery, with all the incrusted wonders of creating beaded masterpieces. You’ll easily pick up lots of tips that you wouldn’t necessarily find easy, learning from a book. Really, these classes are a steal. They’re less than $20 (which is less than the price of many instructional books), they’re excellent references to go back to when you need to, and they’re a lot of fun. I think they’re a really small investment for a real big return. They’re a great way to learn new skills that will bring you pleasure the rest of your life! Hi Mary, Thanks for this. I am considering the Goldwork class having make a complete pigs ear of a beginers kit recently. Will you still get a commission if I use your link? If not, I will wait until the sale is over. Wishing you all the best and a very good weekend. It’s great that Craftsy has a sale on for the on-line classes and they look really interesting. I have taken the Stumpwork and bead embroidery and as well as being good they are really affordable classes and as you say they are a small investment for a big return. Thanks for the information on the sale of Craftsy on-line classes. I hope you have a great weekend. Thanks, Anita! I hope you do, too! Here in Kansas, the sun is shining, the birds are singing, and it promises to be a beautiful day! I have been trying to check out in the process of purchasing an embroidery class……perhaps because of the sale, I have been unable to actually check out. My I Pad has been circling for 20 minutes. I need to go out for the rest of the day and will not be here to complete the information . So, I will probably not be able to take advantage of the sale price. Missing where they are under $20. Thanks so much for all you do to keep embroidery alive and well. Cheers. Hi, Elayne – I’m not sure why that is happening. When I click through, they come up the sale price. Maybe try the first link in the post at the top of the article, then search the classes for the title you want. They should be showing a sale price. The Goldwork class isn’t listed under the sale category, but it comes up 50% off on the regular listing. Elayne, most classes showed up as $24.60 for me but that is because I am seeing them in Canadian dollars. Are you accessing the site from a country other than the USA? Thank you Mary for the Craftsy Sale info. I was able to grab 3 classes at a great bargain. I really enjoyed your article on embroidery kits, it was very informative and it really is great way to learn a new skill. Needle N Thread is my favorite site, I haven’t worked on any projects in years, and now I’m ready to get back in and stitch like crazy. Thanks so much! Oh, no, you should really stop this! I’ve spend more money today after reading your blog article. Maybe you should start with a health and safety warning at the top? I tried to register for the Golwork course. The course was advertised at 50% but when I was going to billing, it turned out it was only a 25% rebate. I thought it wasn’t a fair way to sell things and it was trying to steal from customers. I decided not to buy anything tonight. I sent them an email though to ask them what was the problem with their billing. It is too bad because my mind was set on buying after reading your review and watching the little video. Hi, Louise – the goldwork class was not on their original sale list. As I was going through the classes (not through the sale link – it wasn’t listed there), I noticed that it was listed on my end as $19.99, so I included it in my list of discounted classes. Not sure why it didn’t show up for you that way. Also, as another reader noted, prices from outside the US may be listed in the countrie’s currency, so if you’re accessing from outside the US, the price may be different. I’ll follow up later this week to see if I can get some information on that. Hi Mary – I signed up earlier today for the “Design It, Stitch It” basic class through the link and had no problems. I love Craftsy and have quite a few classes lined up and ready for me to get to work. Thanks for the heads-up about the sale! Thanks for the info about the classes being on sale. Have looked at them in the past, but this time I clicked the link & actually purchased 2 of them! Design It. Stitch It. Hand Embroidery as well as Bead Embroidery. I am still fairly new at embroidery so hope to step up my game. I noticed a comment from Elayne about the classes being more than $20. Most classes came up as $24.60 for me because the prices were Canadian. She may be seeing prices other than USA. I have taken most of these embroidery classes plus others on Craftsy. They all have been really great. And the best thing is I can go back and review a technique any time I need to. Do they include the kit which can be bought separately or does one has to gather all materials? Hi, Isabel – the classes do not contain the kits. In some cases, they are available to purchase. In others, you gather the supplies. This site is so wonderful! I was hoping you can answer a question I have about hand embroidery on a tote bag. I used a cut-away stabilizer on a canvas tote and hand embroidered my design but I am worried that with usage some of the threads will get caught and possibly torn out from the inside. I don’t have access to a sewing machine so I won’t be adding a liner but is there another method for doing this? I have some HeatnBond which I know will hold those in place and keep them visible since it’s clear, I just have to make sure not to iron it and make a sticky mess inside – any suggestions would be great – thanks! Hi, Monica – I don’t usually cover the back of embroidery with a stabilizer, but I can see why you’d want to, if you’re making a tote bag. In that circumstance, I’d probably make a lining for the bag, but without a sewing machine, this would be more difficult. There are some stabilizers that iron on, that are more like cloth on one side, that might work for you. The problem with iron on stabilizers is that they can make the fabric a little wrinkly or bubbly. You might practice on scrap fabric before trying it on your own embroidery. Previous Previous post: Frostings Club Specialty Embroidery Threads – Unboxed!